I’ve been fortunate over the past year to have “met” (in an internet sort of way) many great folks. One who stands out is Rebecca Garlock, the Outdooress herself. She’s a blog/web techno guru-ess and without her generous help and support, the Unaccomplished Angler may have crashed and burned by now. Rebecca has worked under the hood, tightening nuts and bolts to keep the UA limping down the road instead of becoming an abandoned, rusted-out relic of yesteryear. 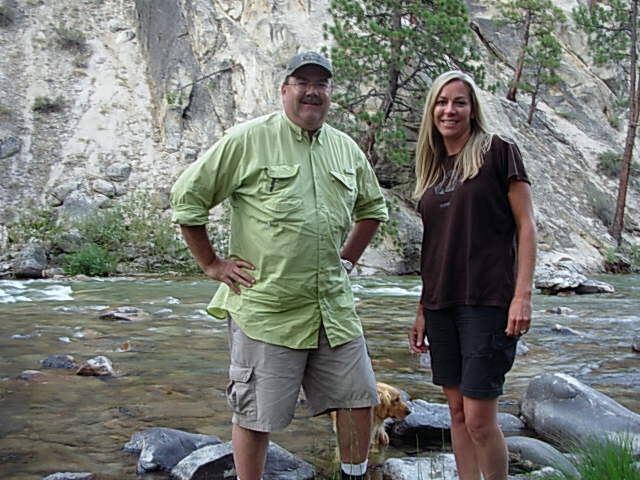 A while back Rebecca told me of an idea that she and her friend Joe Wolf (author of the Flowing Waters blog) had discussed while fishing together this past summer. I half listened to Rebecca’s techno rambling but what I did manage to digest sounded interesting: something about a site for bloggers in the outdoor world, maybe some gear reviews, blah-blah-blah. I had no reason to doubt her good intentions, and it’s not that I wasn’t interested; but I hear a lot of people talk about a lot of great ideas and nearly all the time the talk is just that: talk. Jump ahead a couple of months and I found myself agreeing to design a logo for the brainchildren behind the Outdoor Blogger Network (OBN). The OBN was launched officially on Monday, October 18th, and by day’s end there was a buzz that could be felt throughout the outdoor blogging world. By the second day there were already 79 blogs registered, filling categories that include Fishing (general), Fly Fishing, Bass, Salt Water, Kayak Fishing; Hunting (general), Archery, Big Game, Waterfowl and Upland Birds; Outdoor (general), Outdoor Humor, Outdoor Destinations; Hiking/Climbing/Backpacking, Camping, Bushcraft; Outdoor Photography; Boating/Watercraft; Conservation/Ecology; Outdoor Podcast/Videolog Blogs; Outdoor Business/News; and Outdoor Author Blogs. I’d say that’s a pretty darn impressive assembly of members, what with being open for business for less than 48 hours! So for those of you who blog on topics that fit within the wide range of outdoor interests listed above, get thee over to the Outdoor Blogger Network and submit your musings for inclusion in the site directory. It is my understanding that the nature of one’s blog must be the out-of-doors, but that one may still blog from the comfort of the indoors. At any rate the OBN looks to be a great resource for lending credibility to those of us who keep outdoor blogs, with plenty of opportunities to expand our horizons. If you’re not prone to blogging yourself, but you enjoy reading blogs, then check out the OBN’s offerings: it’s shaping up to be the ultimate blog roll. Thanks to Rebecca and Joe for your vision and gumption to turn talk into walk. and the OBN seems to growing at a fair pace. Man, it’s a good thing they allow bloggers that blog from indoors or I would have never been let in. MN- I’m with you. I’m just worried that they’ll find out I don’t even fish and that I make this stuff up. If that happens I’ll be shown the backdoor to the OBN. Thanks for chiming in.